Manti Te’o has drawn much criticism for his imaginary girlfriend and how he handled the entire situation. Many have claimed that Manti dropped on draft boards because of the controversy. But, maybe there’s another explanation: he was never as good as advertised. I watched several videos of Manti Te’o before the Alabama game even occurred, and it became quite clear to me that Manti Te’o had several glaring deficiencies in his game. 1. He guesses way too much rather than reading plays and letting them dictate his actions. His eyes are in the backfield on nearly every play. 2. He tries too hard to make the big play. This gets him out of position quite a bit. It doesn’t always backfire, but when ball carriers recognize the cut back lane vacated by Te’o, it results in long runs. 3. He tends to struggle with taking on blockers. Ideally, you want your defenders to take on “half the man,” which means that they should be keeping one of their shoulders free so they can get off blocks and make a tackle. Te’o doesn’t do this very well. 4. His tackling form is less than ideal. He often lunges at ball carriers rather than keeping his head up and wrapping up like he is supposed to. For reference, here are 3 videos documenting Te’o games against Florida State (2011), Michigan State (2012) and Michigan (2012). I will be looking particularly closely at a few plays in the Michigan State and Michigan games, but I strongly encourage you to watch all three games closely, and in their entirety while looking for what I noted above. 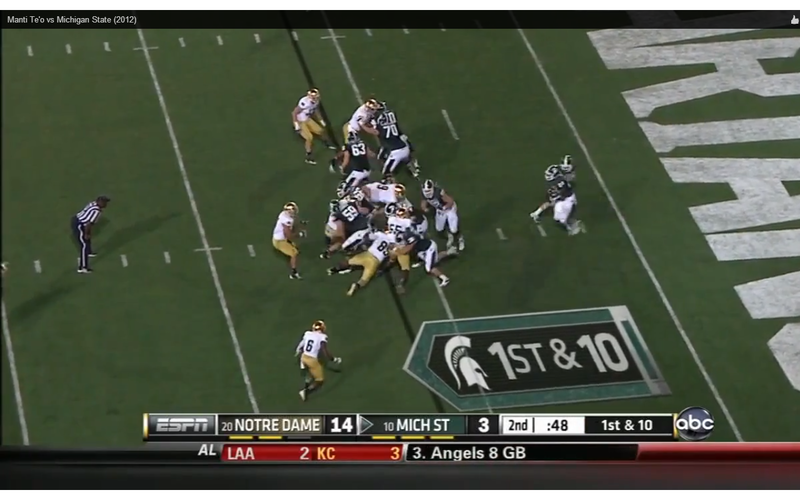 First, I want to start with a great play that Te’o makes against Michigan this past year. I use it to help show the value in reading a play instead of guessing. This is one of the very few times that I see Te’o make a read on film. Not coincidentally, he stuffs Denard on this play. This is right after the snap. This is the most important part of the play. You can see Michigan’s guard pulling to the left. 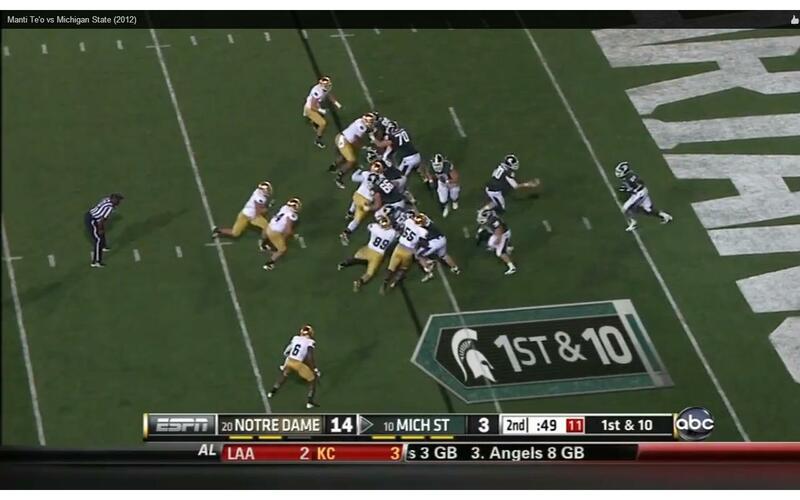 Look at Te’o, you can tell that he’s looking at the guard instead of the backfield. 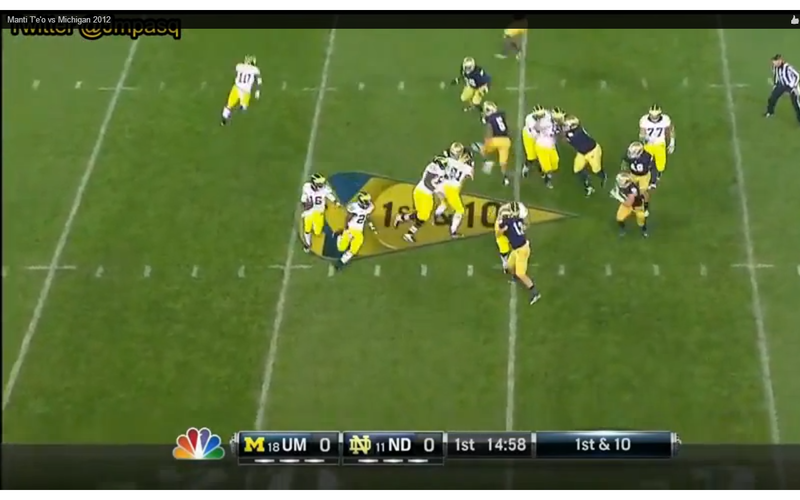 Looking in the backfield, you can tell that Michigan is running a zone read type play. I’m not sure if this is a straight run or a read by Denard, but regardless, it’s the exact type of play that can fool a guy whose eyes are in the backfield. Michigan is faking the handoff at this point. Te’o has read the play perfectly, he’s following the pulling guard to help out on that side of the field because he knows that’s where the run is going based on OL movement. If you’ll notice in the middle of the screen, Michigan’s center (#57) is trying to get to the second level to block Te’o. Because Te’o has read this play correctly, he is able to easily avoid that block. If you remember back to one of the Alabama plays, he guesses on a run play and that allowed Warmack to get to him. He doesn’t guess here and the free OL won’t be able to block him out of the play. 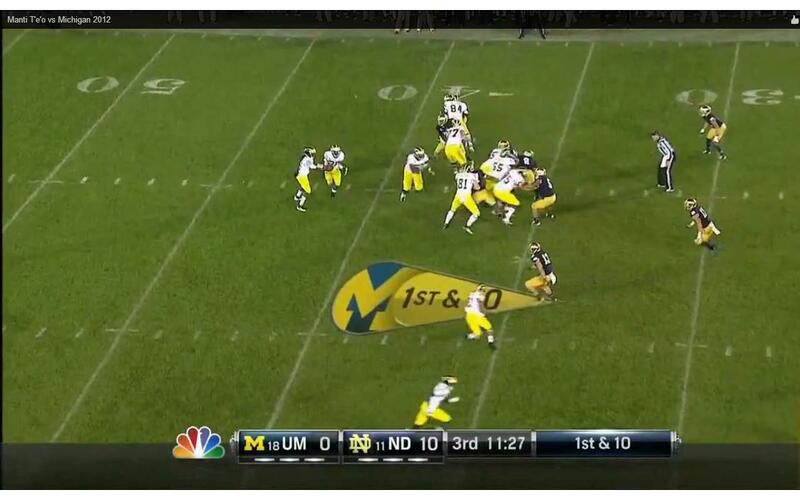 Michigan’s center is still chasing Te’o here. 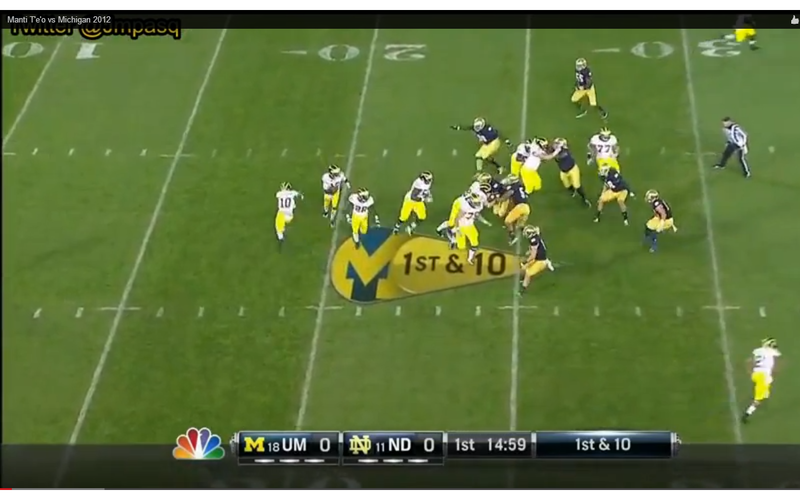 Michigan’s OL has done a great job sealing a big hole for Denard between the ND DT and the outside defender. But, because he read the play, Te’o is able to fill that hole. And he’s able to make the play. 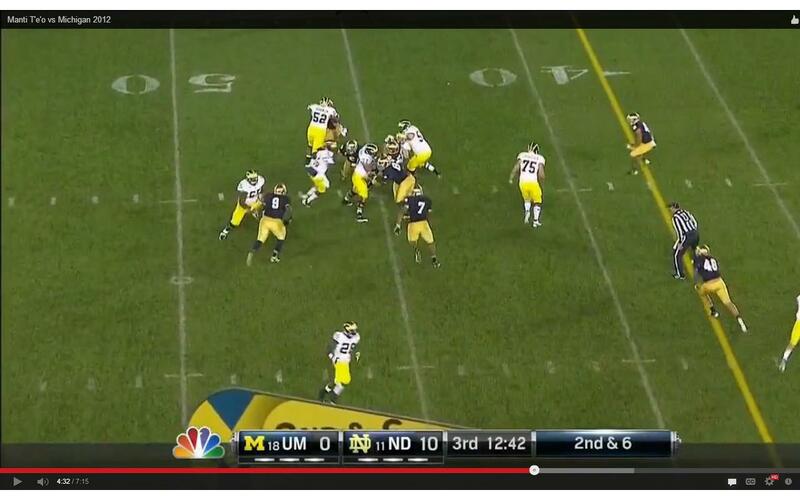 Now imagine Te’o hesitated because he had his eyes in the backfield. Look at how big that hole would be without Te’o. Denard can sprint to the sideline and he’s beating the safety for a touchdown every time. Instead, this play goes for a loss. 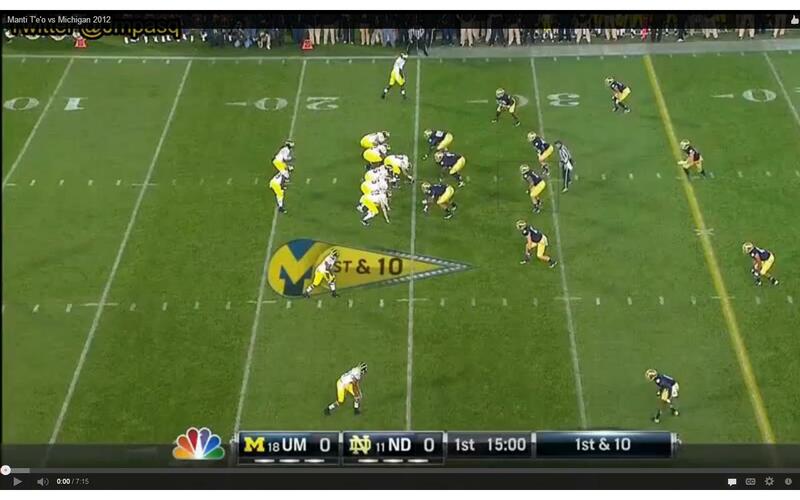 Pre-snap, it’s quite obvious that, if it’s a run play, Michigan is going to run some sort of zone read to the right. 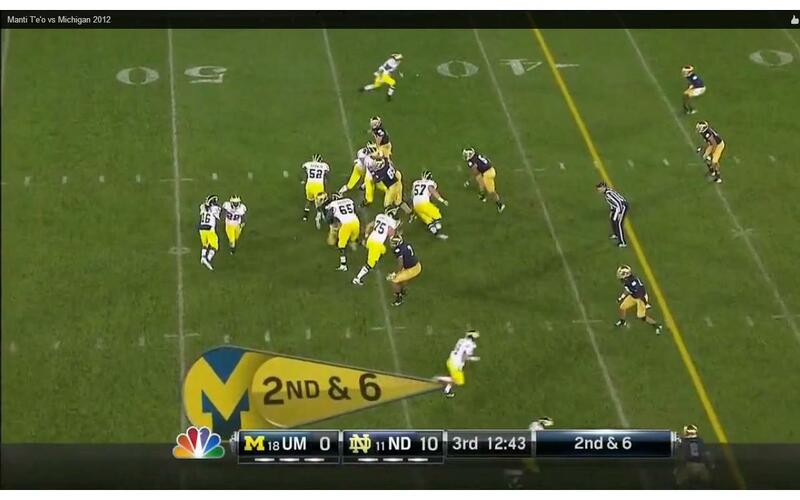 The right side of the OL is overloaded and the running back is to the left of Denard. It’s also important to note that Te’o has a lot of outside help here. He has a defender 4 yards to the left of him and a safety behind him about 4 years who is lined up outside of him. His responsibility is going to be to make a play in the middle of the field should the run come there. Michigan’s guard pulls to the right, as expected. Te’o is fine here. He’s stayed in the middle of the field and he’s taking on a block. Again, note that he still has 2 defenders in the box that have contain priority over him. Te’o gets off the initial block very well. Now he has to take on the guard. Again, he has outside help still. The safety will have to beat the block coming from a WR and the outside defender is free to make a play on an outside run. Te’o only needs to worry about a cutback from Denard. He should be getting inside position on the guard. If he does, this play is going for minimal gain. But, instead of holding his inside position, he guesses outside and tries to make the big play. He vacates the middle and no one is there to provide any resistance to Denard. He did plenty of good things on this play, but he ruined all of it when he guessed at the end of the play. Gary Bertier might call this selfish, show off football. Here’s a similar formation. This is the first play of the game. Michigan runs a sweep to the right with Denard to open pretty much every game. 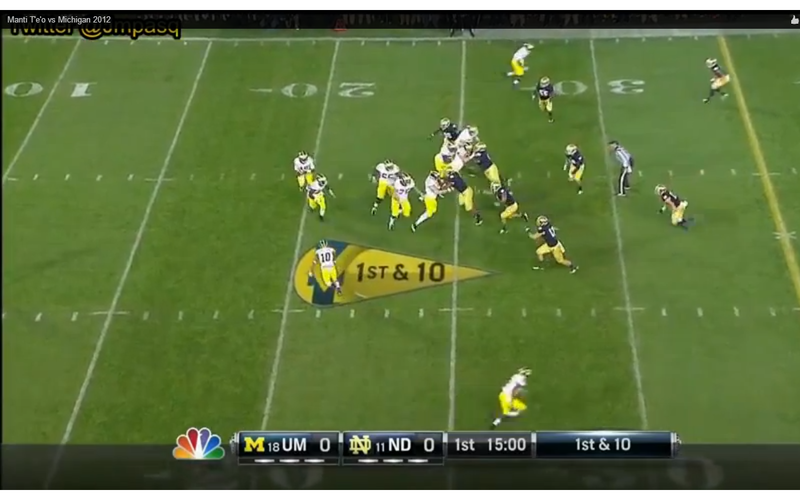 This formation/play certainly should not have been any surprise to ND. Several members of Michigan’s OL are pulling to the right… just what ND should be expecting. 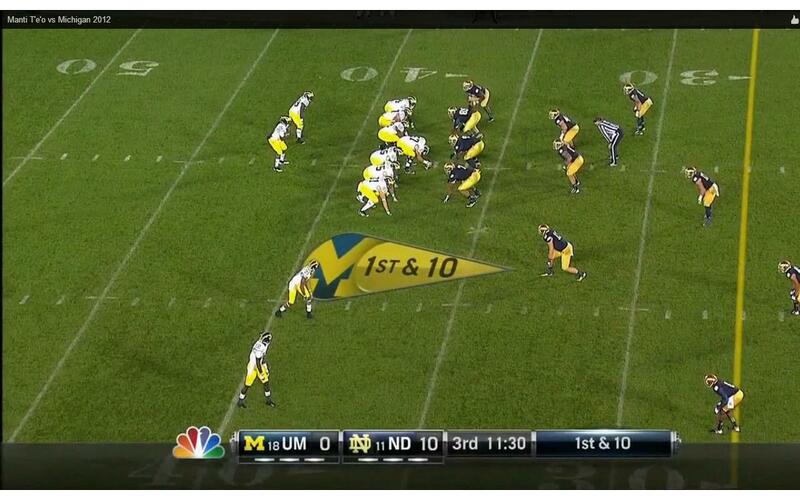 Notice, though, that #10 for Michigan is running some misdirection for a possible reverse. 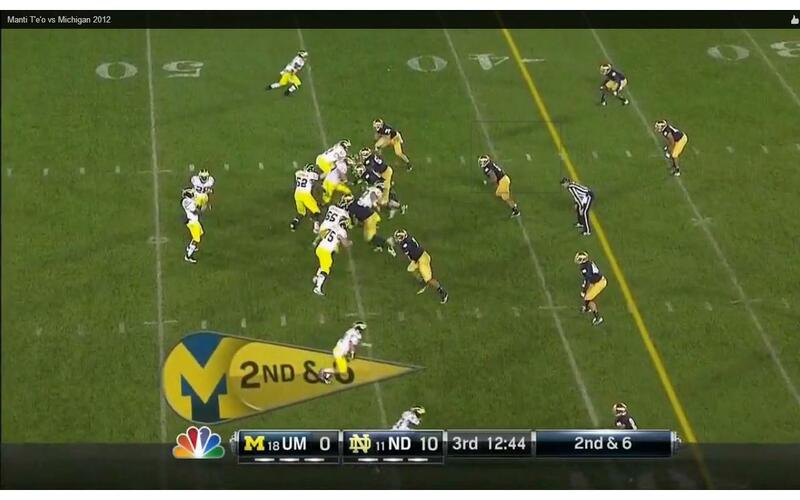 Notre Dame has 2 guys covering the backside of the play, so they’re fine there. Michigan has 3 blockers going to the right, and they basically have what they want… Denard should be 1 on 1 if those blockers can get out to their man in time. But Te’o falls for the fake reverse, much the same way that you will see him do against Alabama in a future post. Now Michigan has numbers to the right side. 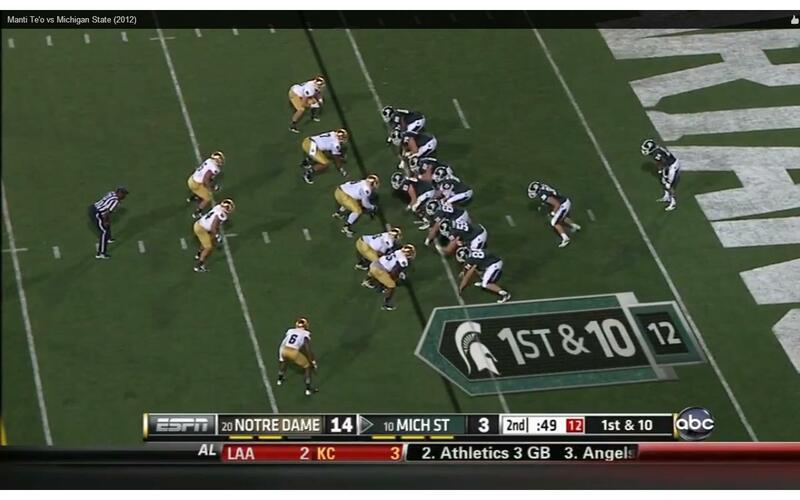 Notre Dame still has 2 guys on the backside who are in perfect position to make the play if the reverse happens. And at this point, Te’o still hasn’t realized what has happened. He has zero chance of catching that WR if there is a reverse and he’s put his teammates in a really bad position on the other side of the field. Fortunately, this play doesn’t go for a big play but Te’o gets big negative marks here. Here’s another play where Te’o screws up and it doesn’t result in a big play for the offense. No one is going to note these types of play because they’re results oriented, but it really makes you question his thought process. You have a super standard formation from both teams. This is a 2 LB set, so Teo’s responsibilities are going to be the left/middle. Both linebackers correctly read run. 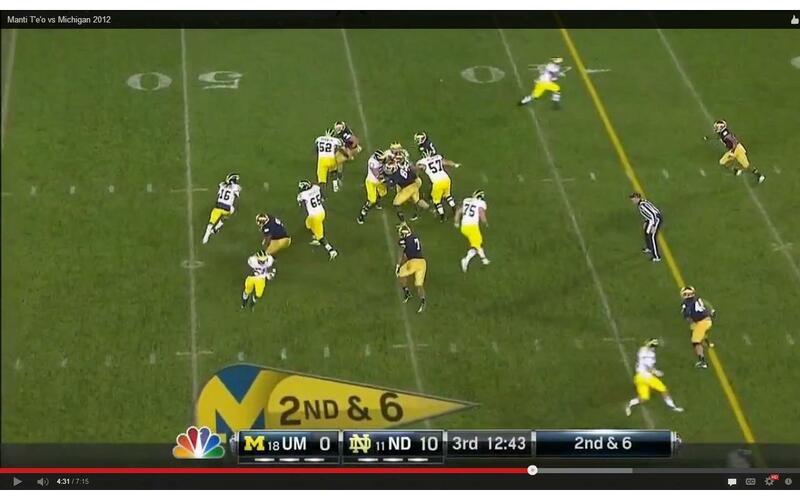 But you can see that Te’o is invading the other linebacker’s area of responsibility very early in the play. 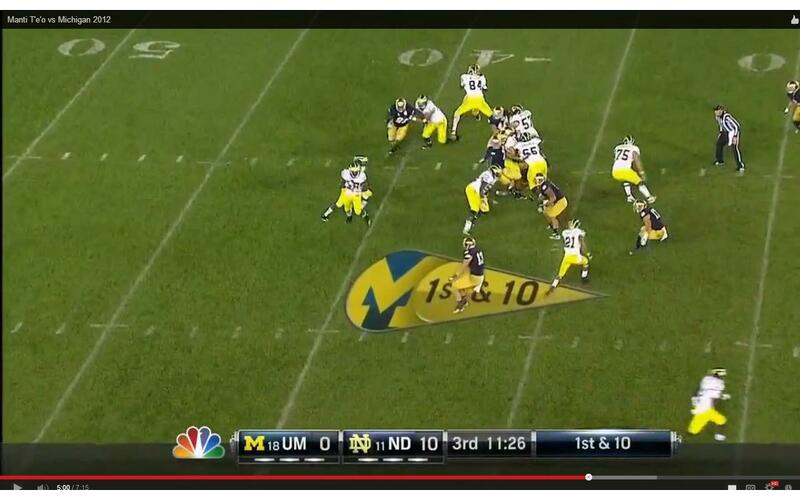 The other LB will fill that gap and then Notre Dame has a defender holding contain. This play is going nowhere fast. The other linebacker takes on 2 blockers. 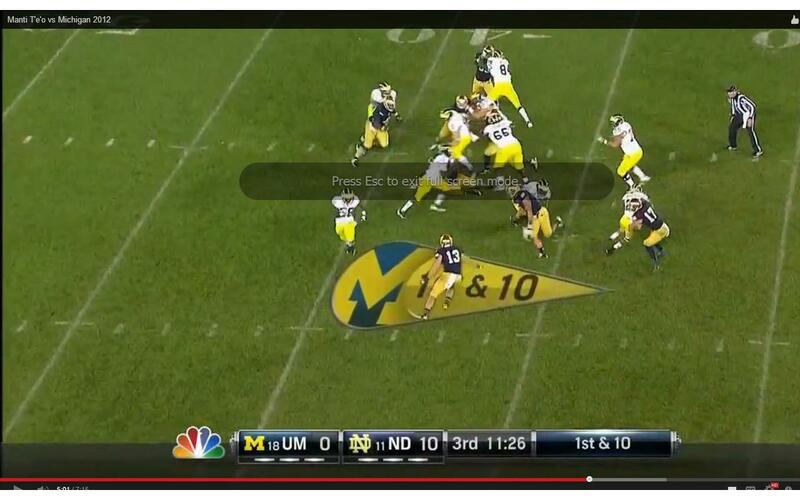 At this point, Te’o has completely crossed behind that linebacker. He’s completely out of position. Bell has nowhere to go towards the left side of the play because the middle is clogged up and the outside defender has contain with no one blocking him. This play is going nowhere, but look at this screenshot and then the next one. You can see the massive hole to the right. That’s the space that Te’o should be moving into. Bell misses the cutback read and so the play goes nowhere. But if he would have seen the cutback lane, he would have had a big gain and it would have been directly on Te’o.